This stay, rail & cruise package will not only have a tour leader & local guides throughout the 14 night Rockies tour but also Sara & Wendy from the 50+ Travel Club will be escorting our own small group within this group. So from day 1 to day 26 (including all travel while on the cruise) we will be your personal tour escorts! This experience of a lifetime awaits with an exceptional Canada & Alaska tour package. This package includes 3 days in Vancouver, a 14 night tour (Vancouver to Victoria), includes overnights in Lake Louise, Jasper, Kelowna, Whistler & Victoria. You will also experience 2 days on the iconic Rocky Mountaineer in GOLDLEAF from Vancouver to Lake Louise with an overnight in Kamloops, travelling through spectacular & glorious snow-capped mountains in the midst of stunning wildlife, you might just spot a bear or two! And to top off this wonderful experience transfer on the Victoria Clipper to Seattle to board your Holland America Line Inside Passage cruise through Alaska onboard the ms Eurodam (Seattle return). Enjoy this 7 night voyage from the luxury of your included verandah stateroom as North America’s last great wilderness reveals blue-green glaciers, endless rainforests, craggy cliffs, majestic peaks, picturesque fishing villages & breathtaking National Parks. • Fully escorted by Sara & Wendy from the 50+ Travel Club, from your first day in Vancouver right through to your 7 night cruise & beyond. • Exclusive to the 50+ Travel Club – 2 nights in Vancouver pre-tour (4 nights in total). Includes airport to hotel transfers on arrival into Vancouver, accommodation, Capilano Suspension Bridge admission, sightseeing tour of Vancouver, special event dinner on Grouse Mountain (Observation Restaurant) with included wine, escorted group tour of Granville Island & Markets, meals included 2 breakfast & 2 dinners. – $100 CAD included at Lake Louise – enjoy a spa treatment, lunch or tour on us! – the First Passage of the West Rocky Mountaineer Route – but more importantly because the train is going into the Rockies which has the best views. – experience the often missed Okanagan Valley – the wine production capital of BC and it is so beautiful! We hope to host you next year on our fabulous journey through this absolutely stunning region. This morning visit the Capilano Suspension Bridge Park where you can make your way across this spectacular suspension bridge, 70 metres above the Capilano River. Take in the surrounding forest and join the award winning Treetops Adventure along a series of elevated walkways. Heading back into the city to enjoy a sightseeing tour of Vancouver including Stanley Park with its intricately carved totem poles, the waterfront area, historic Gastown with its lively shops and restaurants. There is time to freshen up before we end our day at Grouse Mountain, enjoy the amazing views before dinner at The Observation Restaurant (includes wine). We will head to the Granville Markets this morning and enjoy a small group tour of the Island and the markets. After the tour either head back to the hotel or extend your time here. You will be receive $20 CAD for your taxi fare, enjoy the afternoon to explore at leisure. This evening we will meet the full group (Evergreen Tour begins) and our Tour Director for a welcome dinner. Breakfast at the Aquarium. After breakfast, today is yours to explore as you wish. Options (not included) but can be organised prior to departure are: an Ice Hockey game tonight, Bard on the Beach – Shakespeare Festival – an amazing event. Or perhaps hit the shops, hire a bike or stroll through Gastown. Lake Louise enjoys picture perfect surroundings. Spend the day exploring the lake and soaking up the spectacular scenery. Take a walk around the edge of the lake or simply sit back, relax and take it all in. $100 CAD per person to use as you wish, is included. Banff is a picturesque town located within Banff National Park and is the quintessential Rocky Mountains town. Today is for you to enjoy Banff and its many sights and attractions. *Discover More: Discover wolfdogs, take a breathtaking helicopter flight, enjoy an outback dinner and wagon ride, or relax on a float trip along the river (additional cost). This morning we travel north along the Icefields Parkway, acclaimed as one of the most spectacular journeys in the world. Enjoy breathtaking mountain scenery as you pass rugged peaks and glaciers fringed by thick forest and shimmering lakes. We make a stop at the Columbia Icefield, North America’s largest sub-polar ice pack, where you’ll climb aboard the ‘Ice Explorer’ for a once-in-a-lifetime journey onto the mighty 300 metre thick Athabasca Glacier. The day’s end finds us in Jasper National Park, an alpine wonderland of pristine wilderness and abundant wildlife. Two Night Stay: The Crimson Jasper or similar. Today you have the opportunity to explore Jasper and its surrounds. You’re Invited: This evening we journey to the foothills of Pyramid Mountain and experience an authentic Canadian Rockies Western style dinner followed by a wildlife and wilderness presentation and a short forest walk to try to find an icon of Canada, the beaver. Discover More: Discover Jasper wilderness and wildlife tour, float trip along the Athabasca River, an exhilarating motorcycle sidecar tour or authentic Canadian canoe adventure (additional cost). Today is at leisure for you to explore the resort village of Whistler. Transfer on the Victoria Clipper to Seattle. Once in Seattle we transfer to our ship! Check into your comfortable Verandah stateroom on the Holland America Cruise Ship ms Eurodam (see below for ship information) and settle-in for an unforgettable 7 night voyage through the famed Alaskan waterways. Sail picturesque Stephens Passage known for its wildlife and dramatic beauty before arriving into Juneau. Perched on a thin strip of land at the mouth of Gold Creek, Juneau is arguably one of America’s most beautiful state capitals, with the looming summits of Mt. Juneau and Mt. Roberts providing a gorgeous backdrop. Early this morning your cruise ship enters the iceberg-strewn waters of Glacier Bay National Park, where thirteen spectacular glaciers flow from surrounding mountains into the waters of the bay. A National Park Service Ranger will help you spot wildlife, while pointing out sights and explaining glacial activity. Rich native history makes the town an essential stop for anyone interested in native art. Part of the town is built along a steep hillside, part is built on pilings over the water, where bald eagles watch from waterside perches. Disembark early this morning. We will organise luggage storage so you can enjoy exploring Seattle today. We can help organise a Pike Market tour, hop on hop off tour – or whatever else you like to make the most of your day. We will meet at a designated time before transferring to Seattle International Airport to board your homeward flight. Holland America Line’s first Signature-class ship, Eurodam has recently received many exciting updates. 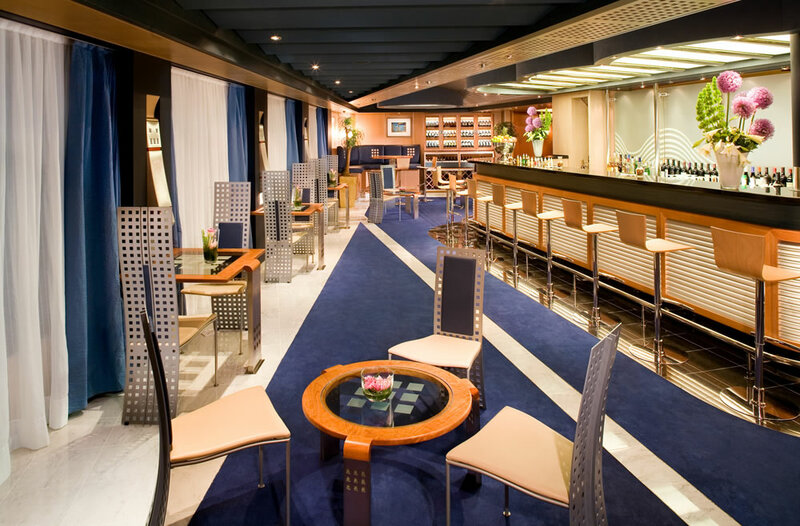 Guests on this graceful ship can enjoy the full Music Walk™ experience, including Lincoln Center Stage, B.B. King’s Blues Club* and Billboard Onboard. Explore onboard at a cooking class or hands-on workshop with America’s Test Kitchen*, BBC Earth Experiences* and a Digital Workshop Powered by Windows®. Dine in your choice of specialty restaurants. America’s Test Kitchen – enticing array of live onboard cooking shows and hands-on workshops. Learn foolproof techniques and user-friendly recipes for making delectable dishes with confidence. BBC Earth Experiences – Discover the connections that unite us across borders and cultures. Explorations Central™ (EXC™) is immersive onboard programing designed to make your journey more engaging, vivid and meaningful. From EXC Talks,™ to EXC Encounters™ to a chat with your EXC Guide™, you’ll feel the spirit of a region come to life. B.B. King’s Blues Club – Direct from Beale Street, B.B. King’s All Stars bring the best of Memphis music to sea. From funky and fast to soulful and smooth, this eight-piece band performs in the B.B. King’s Blues Club in the Queen’s Lounge where you can enjoy specialty cocktails like the Lucille and Rock Me Baby. Filled with light from floor-to-ceiling windows overlooking a private verandah, these staterooms include a sitting area, two lower beds convertible to one queen-size bed—signature Mariner’s Dream™ bed with plush Euro-Top mattresses, and bath tub with premium massage showerheads. *Flights not included, we can organise these for you at an extra cost. ** The tour itinerary may change without notice. See our T&C’s for more details.